Here are initial reports and links to photos & videos of the lively Council House demonstrations in the Market Square and ‘public’ gallery that Notts SOS and other protesters were ‘escorted’ from (one carried out) by police so that the City Council cuts budget meeting could continue behind closed doors after being suspended during the action. Protesting started at 12 noon and continued until 7pm. Council leader Jon Collins was harangued in the Market Square in the evening and there was a ‘Fight the Cuts’ banner drop on Main Marian Way during the day. This was after over 1800 signatures were handed to him from a petition urging the council not to cut services, but to implement a ‘needs-based’ budget. On the same afternoon, Vodafone was targetted by Notts Uncut for its corporate tax evasion and was shut down yet again. There is a lot more to do now cuts budgets have been passed in both the City and County. Come to the next Notts SOS meeting at the YMCA/ICC on Mansfield Road, Monday 14th March at 7.30pm. Also come to the Market Square again today (8th March) for the International Women’s Day centenary events at 5pm focussing on the disproportionate effect of the cuts on women (then at Thompson’s Solicitors at 5.30pm). Many more forthcoming events in March 2011 listed here. 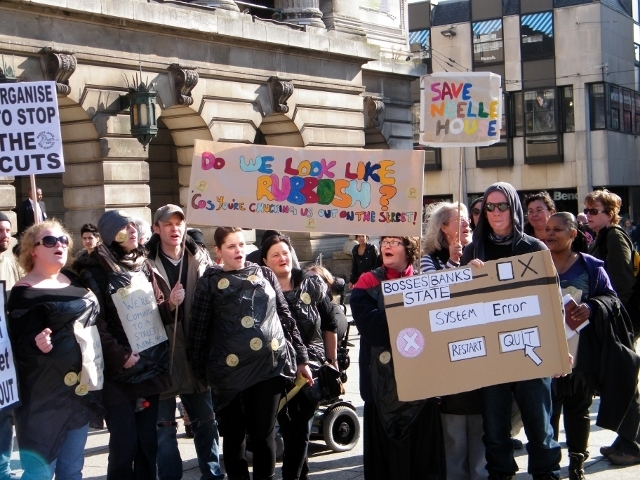 Direct Action Against Nottingham City Cuts Budget. 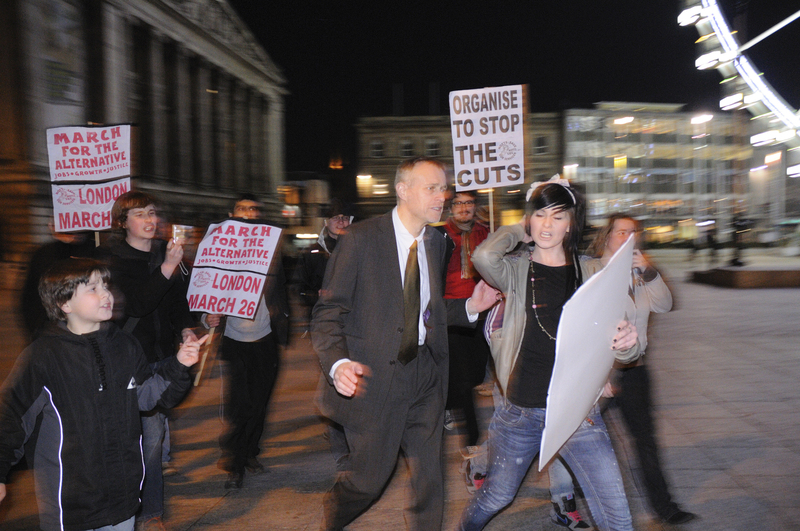 Nottingham City budget protest: Photos. Banner Drop – ‘Fight the Cuts’. More photos from Council budget protest – evening protest including Jon Collins. Inside the council house 1 – also embedded below. COUNCILLORS last night approved some of the most swingeing cuts seen in the city for a generation. Around £33 million of cuts were given the go-ahead at a Nottingham City Council meeting. It comes after the Government reduced the council’s grant by 8.4%. The controversial savings plan will see libraries closed, museum opening hours reduced and employee terms and conditions changed. The council also approved plans to cut its supporting people budget, which helps vulnerable people in the community. I wish to add my voice to those of Notts Students Against Fees and Cuts and Notts Save Our Services in urging Nottingham City Council to stand up to central government and passed a needs based budget. The big society that I want to live in should to be driven by compassion, not market forces. Thanks for giving your attention to this. This is what has happened and what we’re passing to the press. Nottingham City Council are meeting today to pass a budget passing on sixty million pounds worth of cuts, which will hit the poorest and most marginalised in our society. While protests continued outside the building, members of Notts Students against Fees and Cuts and Notts Save Our Services spoke passionately from the public gallery, urging the council to stand up to central government and pass a needs based budget. After a brief exchange the councillors closed the meeting, refusing to listen to the views of their constituents. The protestors then staged a good-natured, peaceful sit-in. They were offered a private meeting with the leaders of the council, which was refused because it was conditional on the end of the sit-in. Eventually the police forcibly removed the peaceful protestors, including a wheelchair user and a young woman who was carried from the building. The meeting has now reconvened in private so that the council can force through its budget against the will of the people of Nottingham. Protestors are gathering again today at 5pm. This entry was posted in Campaign info, Events & meetings and tagged campaign, city, meeting, video, women. Bookmark the permalink.